The crape myrtle tree gives a classic sign that summer is here as the tree bursts into bloom with huge, colorful flowers. The large, drooping flower clusters in gorgeous colors are reminiscent of lilacs (which, sadly, won't grow here). Blooms are followed by heavy seed pods that cause the branches to weep. Though its branches are bare from January into April, this highly-prized ornamental tree is worth the wait for its fabulous show of summer color. 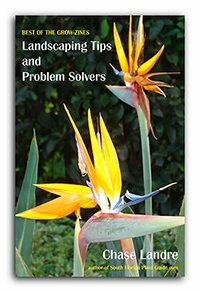 The silhouette and sometimes patterned or colored bark won't put too much of a damper on your winter landscape since most other plants in your yard will still be green. Available in single or multiple trunk specimens, some crapes are more shrubby than others and sizes can vary greatly - from 6 feet to 25 feet tall. So base your buying decision not just on flower color but also on the ultimate size of the plant. 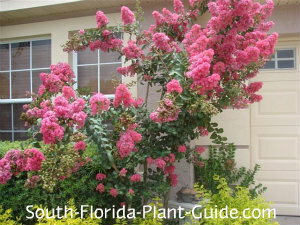 Queen crape myrtle is the largest of them all. 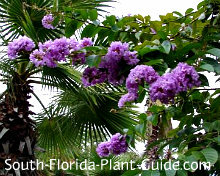 Its blooms are lilac-purple and the plant is more tropical (hardy to Zone 10A). A big plus is that it's only semi-deciduous (loses its leaves for a shorter amount of time as it sheds old ones before new ones form). Queens can get very large - as much as 30 feet or more - and need plenty of space so their branches can spread out. 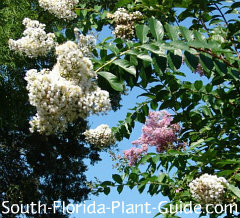 They can, however, be pruned to a smaller size, and make a wonderful, fast-growing shade tree at any size. Flower colors range from white to reds and pinks of all shades, and even purple. 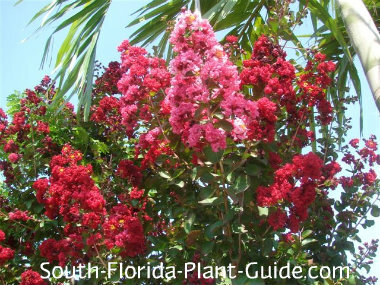 A newer cultivar "Dynamite" crape myrtle (shown in the large photo above) is the reddest of the red and becoming very popular. Dynamite is not a smaller crape, but a slower grower and one you can keep about 6 feet tall. It's a good idea to buy when the plants are in bloom to be sure the color is the one you want. Crape myrtles are considered deer-resistant plants (though nothing is deer-proof). These are fast-growing plants that need a sunny, well-drained area to thrive. Crape myrtles are cold hardy - anywhere throughout Zone 9 or 10 is fine - but they are deciduous, with some varieties putting on a show of fall color before losing their leaves. Flowers begin to appear in late spring to early summer, depending on variety. After the flower begins to die, heavy clusters of seed pods form, causing each branch to droop and the plant to have a weeping appearance. The pods remain on the plant even after it loses its leaves. Add top soil or organic peat humus to the hole when you plant - ideally combining one of those with composted cow manure. 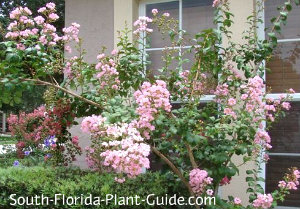 Watering regularly - especially if you plant a crape myrtle tree in summer when it's in bloom - is essential. Trim back after the first bloom to deadhead and you'll get a second bloom. Keep deadheading (if you can reach the flowers, that is) for further flowering. Cut several inches past the seed pod that's forming. You can prune a crape myrtle tree in spring - late March at the earliest - but don't get carried away...too heavy a pruning (often called "crape murder") results in weakened new shoots and ugly dead ends on branches. This is another key reason to buy a variety with an ultimate height you can live with. Seed pods can unleash a multitude of seeds, causing new shoots to spring up around your crape myrtle. If you can't reach the pods to remove them, try to keep the area around the base cleaned up so you don't end up with a thicket of myrtles. Cut off sucker shoots that grow out from the base of the plant. 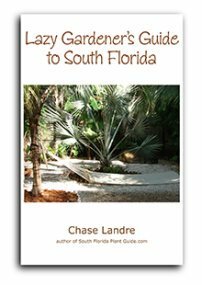 Fertilize in spring summer and fall with a good granular fertilizer, adding a liquid supplement after trimming off the first bloom to promote a second one. 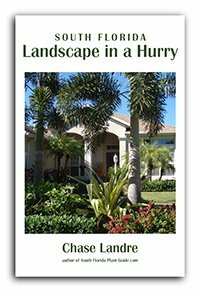 How far from the house to plant depends on the variety of crape myrtle tree you choose. Small ones can go as close as 3 to 4 feet. Larger crape myrtles need to be placed 10 feet or more away. If you plant a row of myrtles, place them about 4 to 6 feet or more apart (again, depending on variety). These plants are way too big for container growing. COMPANION PLANT SUGGESTIONS: Surround the base with low growers such as liriope, Indian hawthorne, Japanese boxwood, and flowering perennials like white buttercup or Mexican heather.